Mark Pollard holds a section of perforated pipe in the basement of the project house, before the slab has been placed. The pipe was used for a radon evacuation system installed in a gravel sub-base beneath the slab. At the rear is the stack for the radon control system, stubbed up. During the blower door test, air flow into the room from the stack stub was readily noticeable until Pollard sealed the pipe with tape. Portland mason Joe Martignetti repairs the building’s block foundation last winter. The existing foundation wall remained porous to air and moisture after the patching and repointing, but the crew applied rigid foil-faced polyiso to the interior to control heat, air, and moisture flow. Joe Martignetti repoints the interior of the basement wall in early winter of 2014. This wall face later received a cementitious parge, but remained vapor and air permeable. A view of the juncture between the existing foundation and wood frame, showing the existing siding, Tyvek housewrap, and sawn wood sill timber. The crew has already jacked up the sill a few inches in this view, in order to apply a Grace bituminous and polyethylene seal sealer. Mark Pollard explains the treatment of the home’s foundation sill during early winter. The bituminous peel-and-stick membrane, inserted between the existing foundation block and the existing wood sill, would later be integrated into the wall system’s Grace Ice and Water Shield air barrier above. But during the blower door test, it became apparent that some air was infiltrating the block walls and entering the basement at the gap between the wall’s interior rigid foam insulation and the spray-foam-insulated band joist area. During blower door testing, Pollard filled that gap with canned foam insulating sealant. A view of the house during building envelope renovation in mid-winter shows the wall treatment in cutaway view. Existing rough board sheathing and rafter tails are seen at the top of the photo. In the near corner, all the layers of the exterior wall assembly can be seen: first, a layer of Grace Ice and Water Shield, tied into the flap of membrane already inserted between foundation and sill beam; then, successive layers of 1.5-inch foil-faced insulation. Later, the foam will be strapped for a vented rain-screen clapboard siding system. 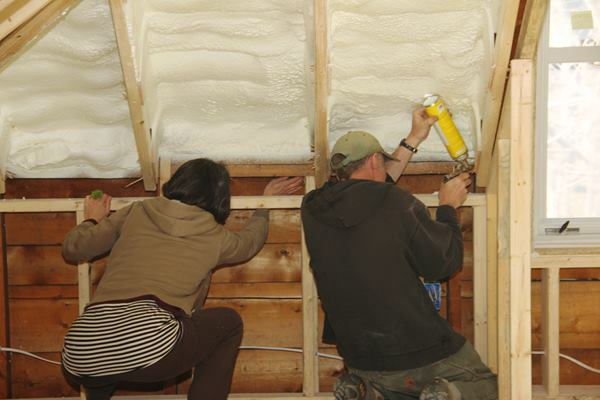 A closer look at the air-tight insulated exterior wall buildout. Grace Ice and Water Shield polyethylene and bituminous membrane wraps over and seals the existing board sheathing. The membrane is sealed to wood window extension bucks using 3M 8067 weather-sealing tape, integrating the window bucks into the air and vapor control layer. Foil-faced polyiso insulation is applied in two layers over the air-tight membrane. The inner layer of rigid insulation is sealed at the seams using Dow Weathermate tape, while the more critical outer layer of rigid insulation (which constitutes the drainage plane behind the wood siding) is sealed with 3M 8067 tape. A worker applies 3m 8067 tape to an Ice and Water Shield edge during winter work on the exterior wall build-out. A worker applies Dow Weathermate tape to the inner layer of rigid foil-faced foam. 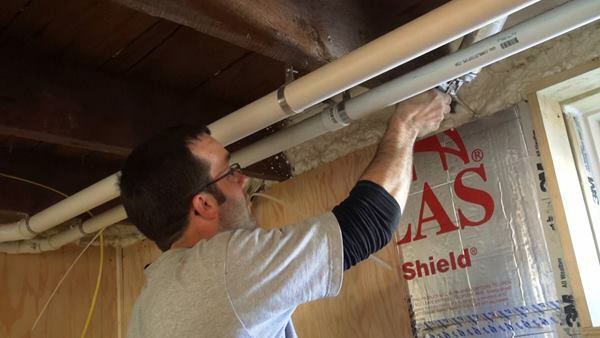 A carpenter applies 3M 8067 tape to the outer drainage-plane layer of rigid foam insulation. The crew accomplished the wall build-out during the severe winter of 2014 despite bitter cold and snow depths of 5 or 6 feet. A closer view of the foam installation detail shows the inner layer of foam, sealed with Dow Weathermate tape, topped with a second layer of 1.5-inch foam. The airtightness problem at the top of the existing wall posed a complicated puzzle. 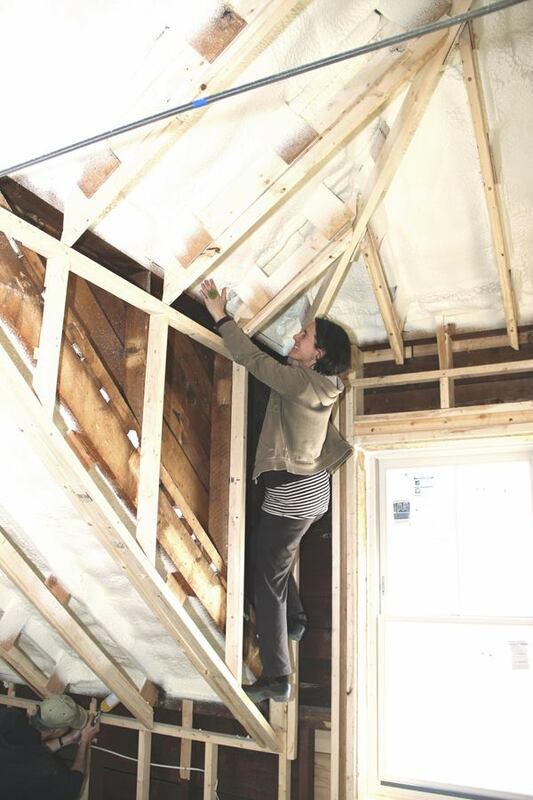 Remodeler Heather Thompson says the team contemplated cutting the rafters off flush with the outside wall and continuing the airtight membrane up the wall and onto the roof sheathing, but elected instead to leave the existing rafters in place in order to avoid the complicated labor of completely rebuilding the eaves. So instead, the crew had to cut foam insulation to fit around each rafter, sealing the joints with can foam as shown here. Project manager Mark Pollard seals a gap around a door jamb with 3M 8067 sealant tape. Pollard seals a vent penetration in the wall using a canister of expanding foam insulating sealant. Pollard point seals wall penetrations using a canister of foam sealant. 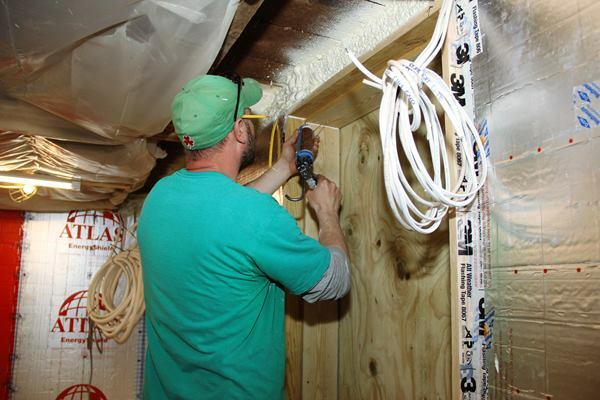 A technician with Portland, Maine-based I&S Insulation, “aka Itchy and Scratchy” (www.iandsinsulation.com) applies high-density polyiso spray foam insulation to the underside of the home’s existing roof sheathing. Another view of the spray foam application to the underside of the home’s roof. 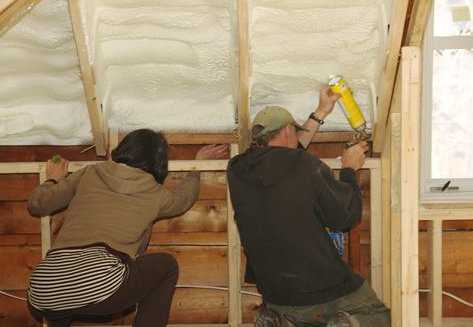 An “Itchy and Scratchy” worker uses gun foam to seal and insulate small gaps in the wall and rafter framing. 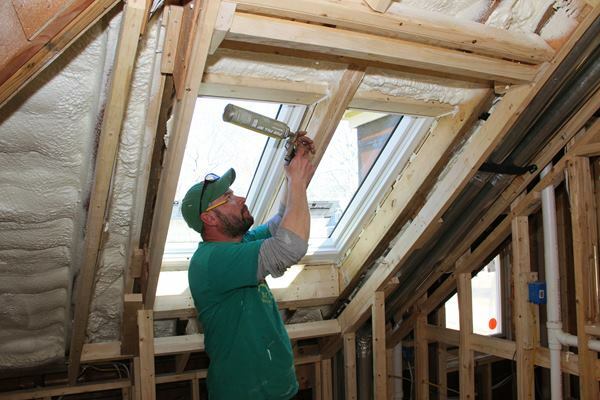 An insulating crew member squirts gun foam into gaps between the existing roof’s skip sheathing. A Thompson and Johnson crew member seals French doors with masking tape as the crew prepares for the blower door test. Harvey Johnson sets up the blower door. Installing the blower door fan into the door. Harvey Johnson fires up the blower door and starts the test. Harvey Johnson explains the blower door control display. Architect Rachel Conly watches as Harvey Johnson adjusts the settings of the blower door control. The preliminary reading, before additional air-tightening and sealing: 127 CFM at 50 pascals depressurization. After the crew chased down and sealed leaks, airflow had dropped to 112 CFM. Project manager Mark Pollard seals the stubbed-up stack of the building’s sub-slab radon evacuation system in the basement. Having run out of smoke pencils during an earlier job, Pollard resorts to an improvised expedient: He fires up a bundle of aromatherapy herbs to provide smoke for leak detection. The herb stick turned out not to be particularly useful for finding leaks, but did seem to have the beneficial effect of calming the crew’s chi (or, to use the Buddhist parlance, stilling their citta). Crew member Ed Muennich feels for air infiltration at the joint between the basement slab and the ledge outcropping (some stone in the basement was left in place for reasons of cost). Supervisor Mark Pollard holds a smoking bundle of aromatherapy herbs. Feeling with the hands turned out to be more effective than usingd smoke for identifying small air leaks as the crew chased leaks during the blower door test. Smoke curls up from a leak in the basement floor at the joint where a newly placed slab meets existing stone ledge. Some of the home’s air infiltration, measured by the blower door test, occurred at this crack in the floor. When the home is in operation, however, a fan connected to sub-slab perforated piping will likely pull indoor air into the sub-slab gravel bed through this crack, rather than allow soil gas to enter the home. Crew members Will Markow and Dale Cunningham and architect Rachel Conly feel for air leaks at the top of the basement wall’s interior rigid insulation layer. Air intrusion at the top of this wall was noticeable during the blower door test. Mark Pollard insulates and seals the gap at the top of the basement wall with a can of gun foam. Mark Pollard spot seals the air gap at the top of the basement wall. The insulation contractors had held back from this area when they sprayed the band joist area, in order to avoid creating a mess. Shane Fenton spot seals a joint in the basement door jamb. 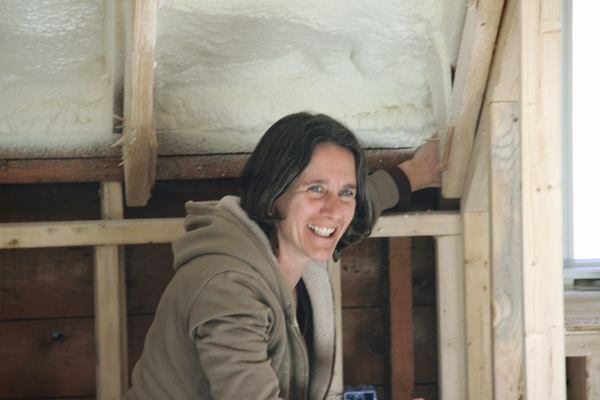 Architect Rachel Conly feels for air leaks near a dormer roof in the home’s second floor living space during blower door testing. The crew found few leaks in the wall system or at joints between the wall and roof systems. Rachel Conly identifies an air leak at a joint where the roof system meets the wall system during blower door testing. Rachel Conly and Shane Fenton locate and seal small air leaks during blower door testing. Rachel Conly and Ed Muennich find and seal air leaks. Armed with a can of foam sealant, carpenter Dale Cunningham feels for air intrusion with the back of his hand. Shane Fenton seals a framing joint with a can of gun foam. Remodeler Heather Thompson, supervisor Mark Pollard, and architect Rachel Conly were holding their breath as Harvey Johnson set up the blower door, connected the controls, and started the test. But it was high fives all around as the blower door told its tale: the three-bedroom, two bath house they had been remodeling all winter was blowing away their expectations (see Slideshow). "I'm hoping for 1.0 ACH50," Pollard said privately before the test, "but I'm telling everyone we're aiming for 1.5." As the digital controller settled down, however, Pollard realized that the home's performance was far surpassing those guesses. At 50 pascals of depressurization, airflow through the door measured about 120 cubic feet per minute (CFM) — somewhere between 0.4 and 0.5 air changes per hour (ACH). 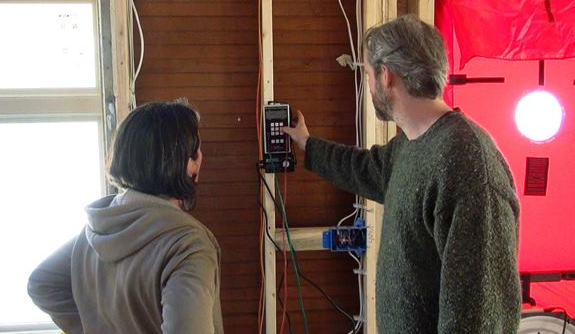 The team wasn't trying to meet the Passive House standard in this project. But at least where airtightness is concerned, the project has surpassed not just the Passive House EnerPHit blower door target of 1.0 ACH50, but even the Passive House airtightness spec for new construction of 0.6 ACH50. After a few minutes of celebration, the crew set about chasing leaks, trying to drive the number even lower (see slideshow). Blower door tests serve at least two purposes: One is to quantify the home's leakiness, which is important not just to demonstrate compliance with codes or program standards, but also to verify that the building's heating and cooling loads won't overtax the specified equipment. Another purpose, however, is to enable crews to identify and plug any leaks, large or small. Chasing leaks during a blower-door test can help bring the building's energy performance into line with its mechanicals, especially if large leaks are identified. And it also enhances durability, by helping to eliminate situations where an air leak may expose moisture-sensitive materials to indoor or outdoor water vapor carried to a cold condensing surface on small currents of air. In this project, most of the leaks were tiny and hard to find. But the test did shine a light on a few problematic vulnerabilities in the building's air pressure boundary. The walls and the roof had no significant issues. But the basement floor, basement walls, and the intersection between the basement and the main house frame showed up as concerns. The original house had been built with a masonry block foundation, set directly on soil with no footings. There was no basement slab — instead, rough irregular ledge formed the basement floor, bringing the ceiling height to around five feet at the rock out-cropping's highest point. In the remodel, Thompson Johnson had excavated under the perimeter block and installed concrete spread footings by trenching, forming, and placing just a few feet of footing at a time. Then they had placed a concrete slab in most of the basement, but not all of it — the estimated cost of excavating the ledge in the center of the basement proved too much for the budget, so the ledge remains in place in part of the basement, and the new slab terminates against this irregular bulge of stone. Inside the block walls, masons repointed the walls and applied a cementitious parge. Then, the crew installed foil-faced polyiso insulation against the block, sealing the joints in the insulation with tape. Even after all that work, the basement was not quite airtight. The irregular joint between the fresh slab and the existing ledge allows some soil gas into the room. And the parged masonry block walls, exposed to the outside air, are still porous. The taped foam on the basement walls is largely airtight; but with the blower door running, the crew was able to feel air seeping in at the top of the foam-faced walls, below the sill beam of the first floor frame. Pollard and his crew attacked that gap with canned foam sealant. The leakage around the slab will be addressed through the building's active radon control system: perforated pipe laid in coarse gravel, with an exhaust stack directed through an outside wall and equipped with a powered exhaust fan. At the end of the test, point sealing had brought the blower door reading down to 112 CFM — easily low enough to surpass any standard in the market.